Thank you for visiting PoolStore, the on-line shop where you can buy above ground swimming pools to suit all budgets and swimming pool owners can buy all the pool accessories and chemicals they need for their pool. Keep your water warm with a new heater. Keep your circulation going with a new pool pump. Installation servicewe can install pumps, heaters, filters, etc. Anything elsewe'll answer any question on pools. We are here to provide swimming pool owners with everything they could possibly need. Whether it be advice, a product, or advice on a product, here at PoolStore can provide it. We take you every step of the way. If you are yet to buy a pool, don't worry you are still in the right place. We can either supply an above ground pool or help you build your own. With our DIY pool kits we can supply every item you need to get you started and our engineers can help you put it all together. Already own a swimming pool? Then we will provide the products to keep your water perfect at the atomic level, the microscopic level and at the visual level. Starting at the atomic level, we provide all the chemicals you need to get the all important pH balance correct. Correcting the acid or alkalinity levels is the vital first step in maintaining a healthy pool for you, your family and friends. A vital weapon in your armoury in this respect is the Pool Water Test Kit. We have many to choose from. Once the water is balanced, it is necessary to keep it clean and safe from microscopic invaders. The correct type of pool chlorine and algicides are a necessary ingredient in water safety. 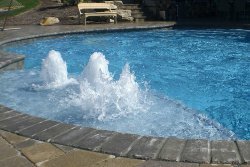 If you don’t want to use chlorine we have non-chlorine pool sanitsers. For that extra finishing touch we recommend clarifiers and flocculants for removing microscopic particles and giving that all-important ‘crystal-clear’ shimmer. We provide the very best in semi automatic sanitisers like UV systems and salt chlorinators. Our pool water testers will tell you if your water is safe to swim in. We don't just sell swimming pool chemicals we are experts in how to use them, you can call us for advice on any aspect of pool maintenance. If you need a replacement pump or spare parts for your existing pump we have what you need. Filters too, whether is is paper cartridge filters or sand filters we offer a wide range from stock for immediate delivery. And if you require assistance, we can install any item of swimming pool equipment for you. Now that the water is balanced, sanitised and filtered clean, you will need to heat it. Swimming pool heaters come in many types; gas heaters and electric heaters are the most common, but the most efficient unit is a heat pump. We can install your pool heater also. When you heat your pool you must have a pool cover to keep the heat in and a pool roller to take the cover on and off. Most owners have a bubble type pool cover. 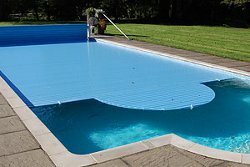 We provide the new geobubble covers but we also provide automatic slatted pool covers. 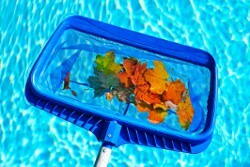 Leaves, debris and insects will always fall in your pool. They have to be removed. We have all you need to get them out from leaf nets with telescopic poles to suction cleaners right up to electric automatic pool cleaners. Once your pool water is clean and warm then you are ready to chill out or play. We have a great range of loungers for relaxing on and a huge range of inflatable toys to play on. If your pool is indoors then you will need a dehumidifier. We can give you the expert advice you need to help you choose the right one. If your pool is outdoors you might want to make it like an indoor pool by putting an enclosure over it. Enclosures are another area of expertise for PoolStore. You can see the various types and get a guide price. If your pool liner has seen better days we offer a nationwide liner replacement service. Not just domestic grade liners but heavy duty pool liners as well. "I don't sell anything that I wouldn't use in my own pool"
- Peter Joyce, Managing Director.